The standard installation of the roof truss system does not represent anything difficult for the master, and the roof of a small country house or a utility room can be built alone. If the roof is large in size and has a complex configuration, you will need helpers and more free time. But even the simplest roof on 2 slopes requires preparation and calculations before installing it. Materials also need to choose carefully. When creating a truss system, you need to remember about safety, since all work will be carried out at height. Part of the final operations is carried out on an inclined plane, which is also very dangerous. Therefore, before the work you need to provide high-quality insurance. With all this, the roof requires strict adherence to technology, since the minimum deviations can manifest themselves after a few years of warps and collapses. Rafters can have various configurations that depend solely on the intended shape of the roof, therefore design is necessary. 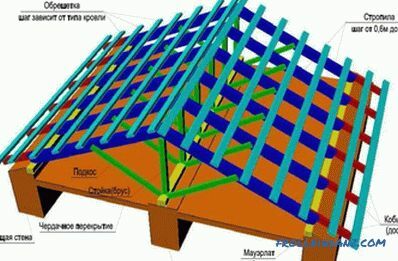 For each type of roof implies a specific device truss system. In simple buildings, barns, bathhouses or country houses, a simple gable system can be used, but for residential premises with a complex architecture and 2-3 floors, the installation of such a roof is most often impossible. For residential buildings, a hip roof, T-shaped or sloping, is often used. According to their purpose, all these species are functional, and the only difference is in appearance. 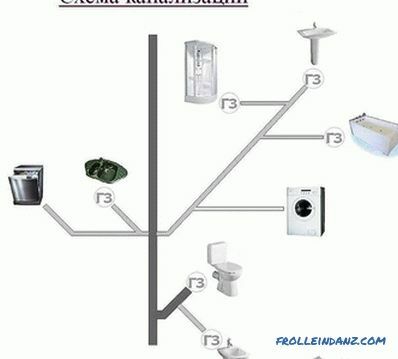 When designing, it is necessary to take into account the material with which the roof is planned to be covered. This is necessary in order to find out the specific weight of the material and make the rafters of the appropriate rafter power. The rafters are divided into 2 types - naked and hanging. 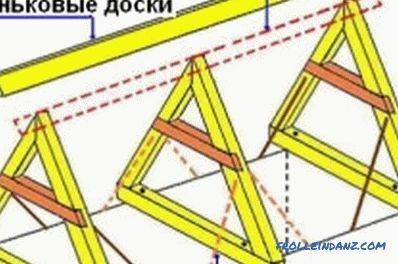 The main figure in the construction of the rafters is a triangle, it is he who has the greatest rigidity. Suspended rafters are based on the erected walls of the building with their slopes, and their middle part is on a special intermediate support. 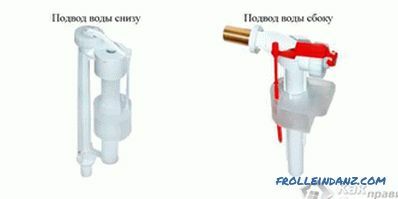 Install them in homes where the middle load-bearing wall or intermediate supports column type. In concrete and stone houses make an additional mount for rafters on the walls - Mauerlat. The hanging type of rafters rests solely on the walls of the building directly or on the supporting beam. Intermediate support in this case are absent. 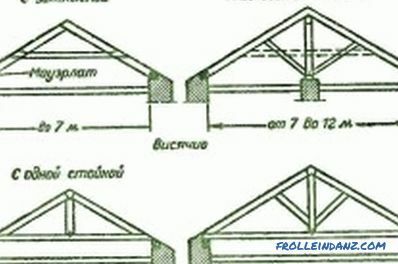 This type of rafter is suitable for buildings with light walls. The bars before installation and construction must be processed accordingly. 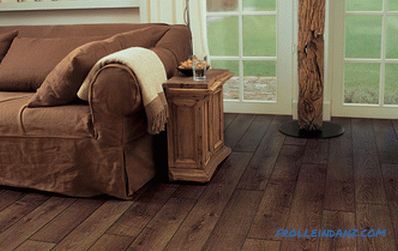 For residential buildings, such treatment involves not only various antiseptics that prevent the premature destruction of wood from moisture and weathering. It is obligatory to protect the rafters from wood from fire. All treatments must be carried out before the rafters are mounted. This will allow to produce a uniform treatment and pay special attention to the joints of the timber. Apply protective solutions in gloves and respirator, a wide paint brush. It is advisable to put 2-3 layers of drying each of them. This will allow the tree to soak better and prolong the effect of the protective equipment. How are the rafters mounted? The first thing you need to do is lay the tarpaulin, the whole further truss system will be supported on it. Lay it over the wall on a belt of concrete. Previously, this belt is required to put special galvanized metal studs. Their diameter, as a rule, is not less than 1 cm. 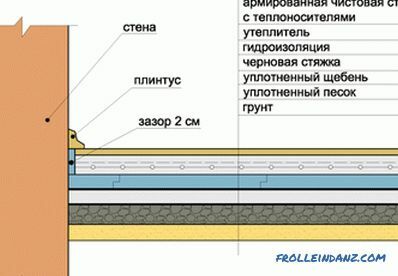 A layer of roofing material or another material with similar properties is placed under the mauerlat for waterproofing a room. When laying a timber near the studs, they determine the places for drilling holes. Then the holes are drilled, the mauerlat is put on the pins in such a way that the protrusion of the pin is from 2 to 30 mm. Mauerlat is fixed with nuts and washers. On the installed and fixed mauerlat there is a direct attachment of rafters to it. 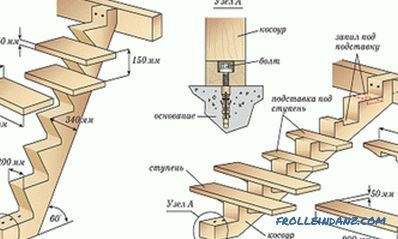 The rafter leg with a serif on it is established in the position verified by the plan. On the mauerlate it is fixed using brackets, screws and brackets. Such a multi-level mount for rafters is necessary, as the bracket prevents shearing along, and the bracket - offset across. 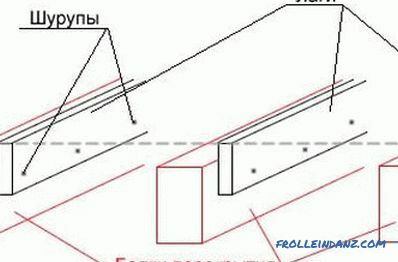 In the same way they fasten the rafters and the ridge bar.Intermediate lath, which will connect the opposite rafters in the shape of the letter A, ridge mount reinforce. To connect the rafters to each other, studs of different diameters are used. They are selected depending on the roof covering and its weight. Rafters tend to move along the axis, and to prevent this, 2 pins are used for each joint. The holes for the studs need to be drilled in advance, and then they are fixed with reinforced washers and a nut. If the size of the proposed timber is not enough, there is a way to extend it. The overlap of the bars on each other should be at least 1 m, and the studs connecting them should be at least 1 cm in diameter. If at installation of rafters on a very large roof their length exceeds 6 m, it is required to exclude their sagging in the middle. Sagging in such long rafters occurs under the weight of its own weight, under the weight of the roof and from the snow in winter. Preventing this, establish the middle girder: a thick bearing bar across the rafters. You can, in addition, install struts, transverse beams. If you plan to make an attic, the latter method is preferable as more reliable. The ceiling of the attic room can then be installed on these struts. Completing the installation of the rafters of the building roof, the timber is cut to the level of the eaves. On rafters, small ramming bars are stuffed, waterproofing is being installed and insulation is being laid. Then on the finished rafters produce work on the installation of the roof.